Home / back to school / parenting / school year 2015 to 2016 / Back-To-School Transitioning Reminders: Parents, Are You Ready? Back-To-School Transitioning Reminders: Parents, Are You Ready? With only a few days left, you should be prepared to welcome the school year which officially will start on June 1 and will end on April 1, 2016 based on the issuance of Department Order No. 9, s from the Department of Education. I am sure, not only are the kids excited yet groaning at the same time but most especially you, parents. Or maybe it already started the time you spared a chunk of money when you enrolled your kiddos? Yeah, I got you fellas! Being a parent, it is a great influence henceforth to start creating a positive mind set to be instilled to your kids especially towards their attitude this new school year. As early as now, you have to let them understand that the remaining days of idleness and vacation time is over and for them to be excited and confident instead towards being back to school, accumulating and learning a wider scope of knowledge, being back with their friends and group, and the potential of meeting and gaining new friends (for first timers, or transferees) in order to boost their performance both socially and academically. The transition can be a little bit off for children especially due to the adjustment to greater levels of school activities, pressures associated with school life again like assignments, exams, the demands of the subjects, quizzes, projects, etc.) and to parents due to expenses like tuition fees, books, projects and listening or dealing with your kids’ difficulties and frustrations with their lessons or subjects among others. 1. Invest in health. Before the school year starts, it will be a great idea to schedule your kid for a pediatrician and dentist check up. Most of the time, a lot of kids will miss their classes in the midst of the school year due to sickness. A lot of time, those absences will lead them from missing lessons which will result to missing homework and a higher chance of a lower score in exams. These definitely will affect their grades. It is a domino effect. Most parents in the Philippines skip this opportunity of ensuring health for their kids when in fact this is the most beneficial as it gives the chance to identify any potential health issues even before the classes start. Try to ask for flu shots and other immunization shots for your kids. 2. Allocation for possible school-related expenses. This is something you always have to be watchful about. These are the unexpected miscellaneous expenses (in order not to be surprised about it). During the time that the school’s out, there should at least be a piggy bank, or a cash fund intended already for this school year. Always, and I’ll repeat, always make it a point to spare a certain amount of money every payday or every time you earn your income just to be prepared rather than to panic when it is already in your face and what you will do is to borrow money from relatives, friends and acquaintances. Be responsible and sensitive. They too have a lot of expenses to think about so don’t add up to the pile. Do an advanced budgeting. 3. Setting back the “schedules that need to be strictly followed.” That includes turning off the TV, minimal time for online access and video games, and when will be the bed time, homework time, and meal time. This will create a clearer line and for stricter obedience so they will also adapt to the mindset that yes, school year is something to be taken seriously. 4. Make sure that you have all the information. Make copies of the materials provided when you had your kids enrolled. These include information about your child’s teacher, classroom number, school supply requirements (P.E uniforms, books), any after-school sports and activities, school calendar dates, school transportation (if provided by the school) health and emergency contact numbers, and others. It is great if you accompany your kids to visit the school (if he is young or just new to the school) so you can check and locate his classrooms, locker area, pantry area and for him to familiarize himself to the new environment. This will help your kid in easing out pre-school anxieties, too. 5. Be supportive. This I believe is often the neglected part. There is an intense, overwhelming demand of being a student and juggling that all-in is definitely a stressful thing to do, so don’t add up with the pressure that your kid is already dealing with. Most of the kids will complain how unsupportive their parents are when it comes to their schooling and is often even being scolded for running late or for not helping with the household chores when in fact, your kids are already extremely exhausted. We were kids too, before. We know how hard it is to study. So try to reinforce your children’s ability to cope by being there by their side instead. Bear in mind that these are kids, they are our kids. And we are letting them learn how to understand the bigger picture and to let them blossom and fly on their own. Education is the greatest weapon that we can hand to our children for them to overcome the hardship of life. So let your children know you care, every step of the way. Children absorb their parent’s anxiety, so be vigilant of your own attitude and try to model optimism and confidence for your child. Give your kid the attention that he needs. Encourage him to know how to schedule and budget the time so it will not be stressful for him to juggle things. Incorporate a peaceful home for a greater concentration on schoolwork. Back him up with activities that can be fun and educational at the same time. Be a friend. 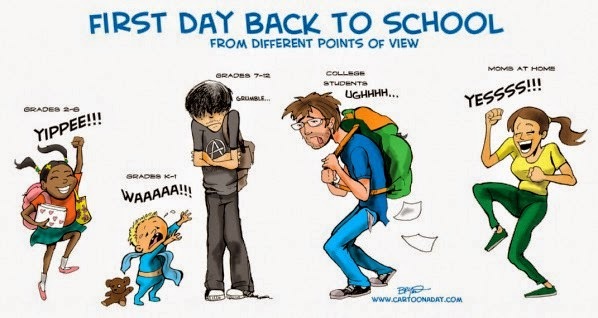 Happy school year, parents! and I salute you beforehand. Congratulations!